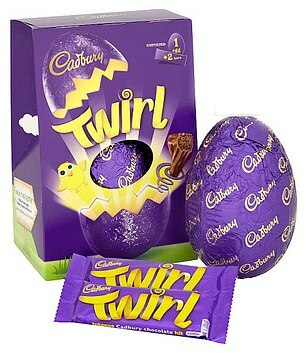 Peeling back the foil and cracking open the shell of a chocolate egg used to be a joy reserved for the Easter weekend. But retailers are taking advantage of sweet-toothed Britons by selling chocolate treats months too early, health bosses claim. The Royal Society for Public Health (RSPH) said the prominent displays of chocolate eggs in every shop are an ‘unnecessary temptation’ in a nation beset by obesity. With three weeks to go until Easter Sunday, half of the UK public have already bought and eaten at least one Easter-related chocolate treat, the organisation’s polling suggests. Critics last night accused the RSPH of nannying the public with its ‘incessant nagging’ and ‘constant scaremongering’ over harmless treats. But the RSPH pointed out the average Easter egg contains almost three-quarters of an adult’s recommended daily calorie intake. Chief executive Shirley Cramer said: ‘We recognise that special occasions such as Easter are a time for indulgence and treats. ‘However, it is clear many shops and supermarkets are pushing products way too early – it isn’t uncommon to find Easter eggs on sale in the first week of January. ‘Our research suggests the public find this mildly irritating and it is just putting unnecessary temptation out there, particularly for children. The RSPH insisted the public supports its stance – with its polling suggesting 77 per cent think supermarkets sell Easter confectionery too early. Some 57 per cent of parents surveyed said their children had been tempted by Easter-themed treats displayed near checkouts. And 38 per cent admitted their diet is less healthy than normal when supermarkets push seasonal products. A third of children and two thirds of adults in Britain are now overweight, contributing to increasing rates of diabetes, heart disease and cancer. Health bosses want children to consume 20 per cent less sugar by 2020 but two in three major brands have so far ignored Government pleas to cut levels. The Government is now consulting on a range of proposals to reduce childhood obesity including banning junk food ads before the 9pm watershed. 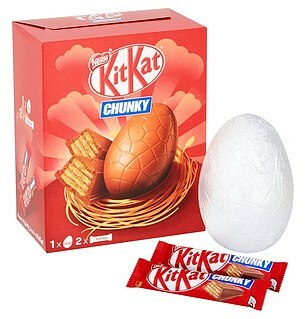 Louise Meincke, head of policy at the World Cancer Research Fund, said: ‘Advertising and selling Easter eggs weeks, and sometimes even months, in advance of the holiday is just another tactic used by industry to encourage people to make unhealthy choices. ‘This is unacceptable during the current global obesity crisis. ‘We want the government to lead the way by implementing policies that make our daily environments healthier. The clampdown on Easter festivities comes two years after the National Trust faced heavy criticism for renaming their annual ‘Easter Egg Trail’ the ‘Cadbury’s Great British Egg Hunt’. 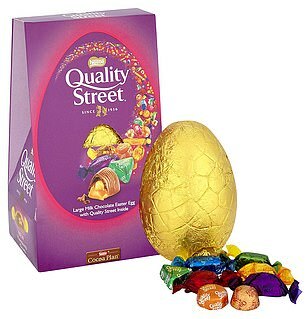 A Nestlé spokesperson – which represents Quality Street, KitKat and Galaxy – said: ‘Our Easter eggs include messaging to encourage consumers to enjoy the chocolate egg in moderation and to share it or save it for later. A spokesperson for Mondelēz International – which represents Cadbury, said: ‘At Mondelēz International, we are incredibly proud of the products we make. All of them can be enjoyed as part of a healthy, balanced diet and are loved by consumers around the world. ‘However, as the UK’s largest branded food manufacturer, we know we have a responsibility, along with the rest of the food industry, to help address public health concerns. 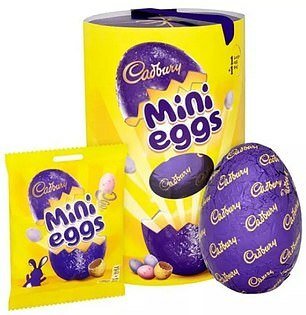 ‘We always encourage our consumers to be treatwise and our larger format products such as Cadbury Twirl Large Egg and Cadbury Mini Eggs chocolate Egg that are intended for sharing are re-sealable with clear information on pack for consumers regarding individual portion sizes and calories. 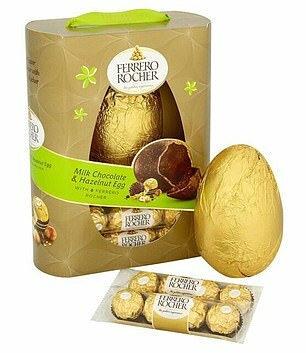 A Ferrero spokesperson said: ‘Ferrero creates festive eggs to be part of Easter celebrations. 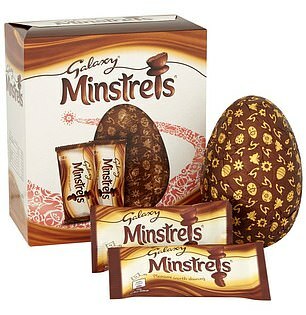 Mini Easter eggs are a deadly choking hazard, an expert has warned. Nurse and first-aid trainer Emma Hammett, claimed the chocolatey treats are the same size as a child’s airways. Babies and young children can choke on anything small enough to fit through a toilet roll, resulting in them struggling to breath and being unable to talk or cry, she said. Although mini Easter eggs’ manufacturers state they are unsuitable for youngsters under four on their packagings, many parents are oblivious to warning. Ms Hammett advises parents reduce their children’s choking risk by buying them larger, hollow chocolate eggs, as well as keeping an eye on them while they indulge over the holiday.